RIO GRANDE — An old tradition is coming back to the area. For years the canoe livery on Bob Evans Farm in Rio Grande offered an aquatic view of Gallia County from Raccoon Creek, but was closed some years ago. “I was in sixth grade when I first went canoeing, a couple friends of mine took me there and I ended up taking my church youth group there and we had a blast,” said Patricia Filie, owner of the new operation. The new business, which purchased a small portion of land along Raccoon Creek will be known as Raccoon Creek Paddles and Oars, and is planning to open for business early in May. In the mean time, they are looking for volunteers to help prepare the creek for a season of kayaking and canoeing. “We are asking for volunteers right now, in the next couple of weeks we are hoping to get volunteers to help clean up the creek. We will set a date and we’re going to start cleaning the trash and debris, the main goal is to make it as beautiful as possible,” said Filie. 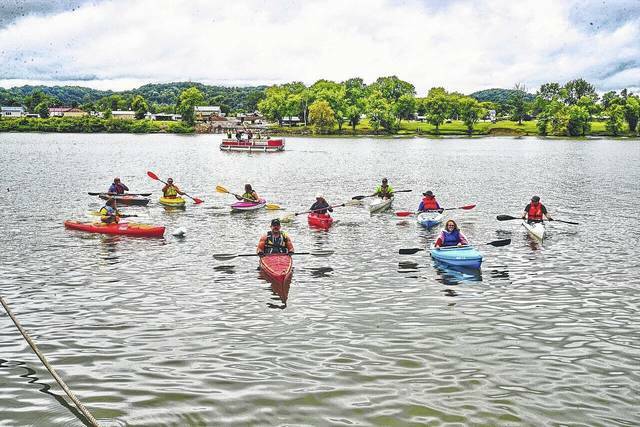 The standard fair will be offered for those wanting to paddle along Ohio’s longest creek, canoes and kayaks. According to Filie, they will primarily offer kayaks at first and hope to increase their offerings as the business grows. “We’re going to have both kayaks and canoes, but mostly kayaks because that’s the big thing right now. It will be limited at first, the reason is we are just opening up and we need to see how the business is,” said Filie. The way the business will operate is with multiple trips offered, dropping off paddlers with their kayak or canoe upstream for them to paddle back to the livery on the farm. They will also have trips going down stream as far as Cora Mill, where they can be picked up and brought back to the livery. Trips in both directions will vary in length. For those with their own vessels, the livery will also provide a drop in service for a fee. “We definitely know that we will be dropping off at Vinton Park all the way down to the canoe livery. I’m going to say it’s a five hour trip for someone that’s not a real fast kayaker,” said Filie. Safety will also be a primary concern for guests of the livery. Life jackets will be provided and required for those using rental equipment as well as a safety briefing for each group that is heading out. As a part of the business, primitive and RV camping is available as well as a shelter house for parties. Various events and bonfires will be offered throughout the summer, and the rental will be open through October for the Bob Evans Farm Festival. If you are interested in volunteering to help clean up the creek and learn more about services offered, contact Filie at 740-645-9762.